Every Monday night my fiance unfortunately watches WWE Wrestling. Most of the time one of his friends comes over to watch with him. He is a great guy, and single so of course the mom in me wants to make sure he gets fed right. Also, he is NOT picky like my fiance and loves to try my experiments. I decided Taco Salad was on the menu for tonight. 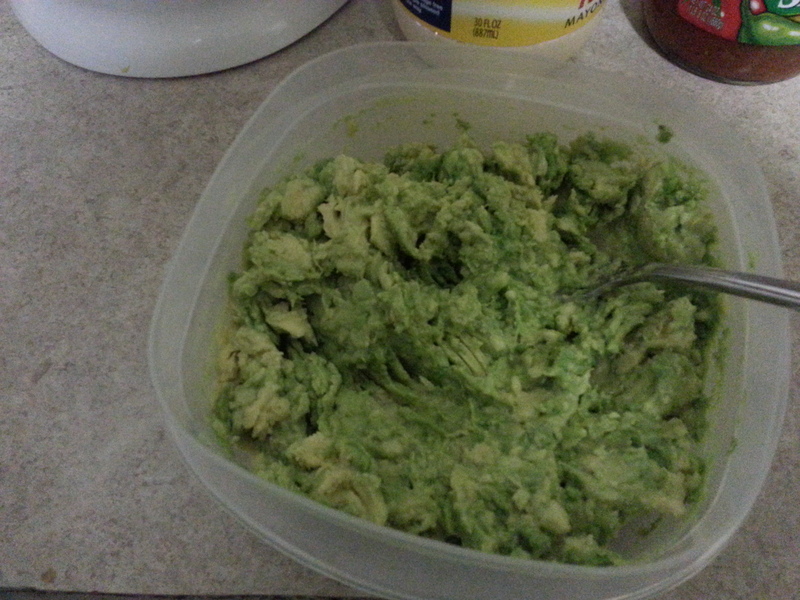 While at the grocery store (because of course I had nothing in the house for taco salad), I saw avocados and remembered he loves my guacamole. I found 2 kinda soft and decided that we had a new item on the menu! In a bowl mash your avocados with a fork, making them as creamy or chunky as you like. I leave some decent size chunks because I LOVE the taste of avocado. Add 1-1.5 TBS of Helmans Mayo and stir. 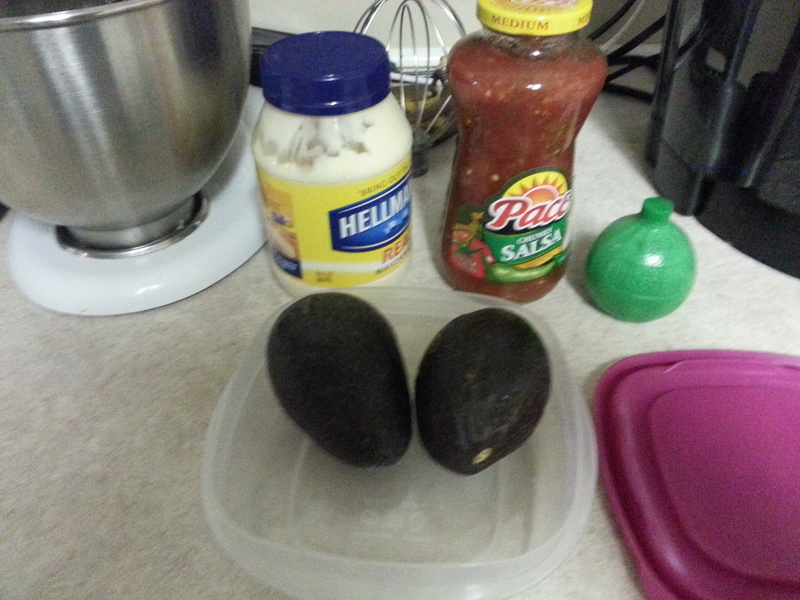 You want it to have a creamy texture but not have the mayo overpower the delicious avocado flavor. I recommend you start out small with the mayo and add more if you need to. It is difficult to remove too much mayo. Next add in and mix 1/4 cup of your salsa. 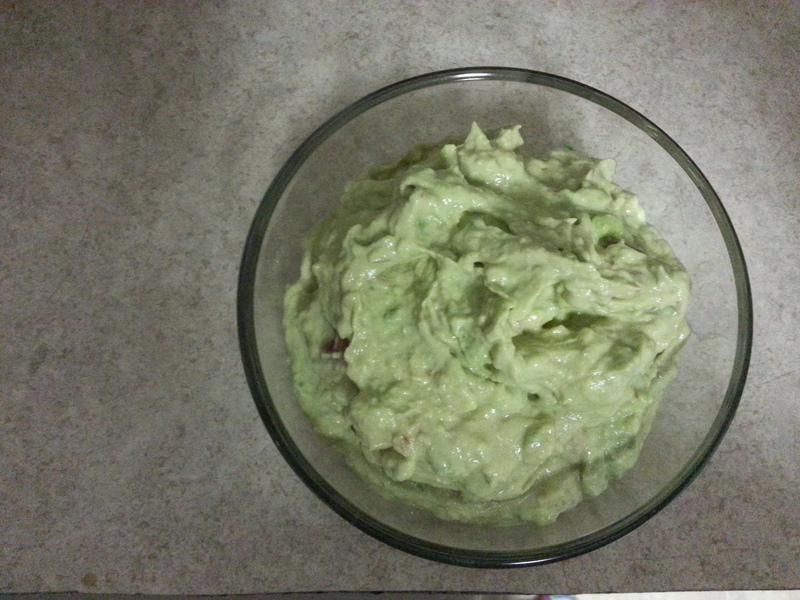 Add 1 tsp of lime juice to help prevent the guacamole from browning as fast as it tends to do. Again this is just what I did. If you like more, or less, by all means use what you want. This is just what I used last night. If you use a different brand of salsa and mayo that’s fine too. Personally I will only use Helmans. Anything else tastes awful to me. The Pace Salsa was what happened to be on sale yesterday or I would have bought store brand. This is so easy to make and really doesn’t take much effort. Of course you can always pretend otherwise 🙂 . This went over just as I expected. Loved and enjoyed by everyone everyone except for my fiance who made questionable faces at it! I really hope you try this and enjoy it. It is so easy and oh so delicious. ENJOY! !